Six different Maple Leafs scored and Patrick Marleau notched career assist No. 600 to help Toronto defeat the New Jersey Devils 6-1 on Friday night. On a night brimming with stars, the Maple Leafs' supporting cast came up big. "It's definitely cool," said Toronto goaltender Frederik Andersen. "It's one of the great things about playing in the hockey capital of the world probably, you get to see these things. You get a lot of legends of the game through these doors here. That's extra special." Entering the Hall on Monday are former New Jersey goaltender Martin Brodeur, Martin St. Louis, Alexander Yakushev and Jayna Hefford in the players' category, and NHL commissioner Gary Bettman and Willie O'Ree, the first black player in the NHL, in the builders category. "It's a club like no other," Toronto coach Mike Babcock said of the Hall of Fame. Marleau was involved in Kadri's goal, becoming the 88th NHLer to reach the 600 assist milestone. The only other active player with 600 assists is San Jose's Joe Thornton (1,032). "It's always nice when a milestone like that comes with a win," said Marleau. "The guys played great tonight so it was fun." "I think [Andrei] Nazarov scored it ," he added, referencing the 1997-98 season. "There was a lot of those seeing-eye pucks tonight that went through crowds," said Babcock. "It's never fun being at the wrong end of those, [it's] more fun being on the right end." Kinkaid, who replaced Cory Schneider in the second period of Tuesday's 7-3 loss in Ottawa, had a busy night in the Devils' goal. Fans held their breath when Tavares went down on a knee-to-knee hit that earned Sami Vatanen a kneeing minor. But the Leafs $77-million US man got up and almost set up Marleau on the power play. Kinkaid was called on again early in the second period, stopping Johnsson on a breakaway. 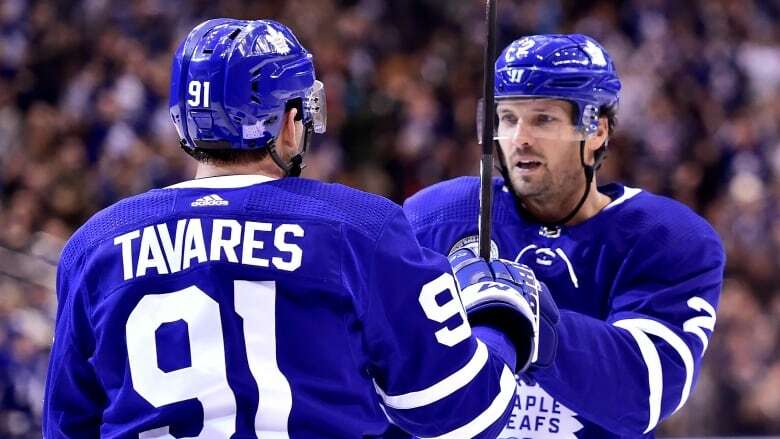 But Kadri beat him at 1:52 of the period, roofing the puck from the faceoff circle after controlling it mid-air from Marleau's milestone feed. Rielly's goal was one of those seeing-eye shots, wending its way through traffic and past a befuddled Kinkaid. It was his seventh of the season, tops among defencemen. Ennis' goal was more memorable, top shelf after a nifty move coming out of the corner.